Dedicated to research and teaching in the realm of Model Engineering at the Business Informatics Group of the Vienna University of Technology. The complete FSM example is also provided together with the xMOF component of GEMOC Studio. In the end of the tutorial, you find instructions on how to install the example. For setting up GEMOC Studio, download the latest version of GEMOC Studio from gemoc.org. The download will deliver a compressed zip or tar.gz archive. Decompress this archive into a directory of your choice and ensure you have full read and execute permissions for this directory. Start GEMOC Studio by running GemocStudio.exe on Windows or GemocStudio on other platforms. 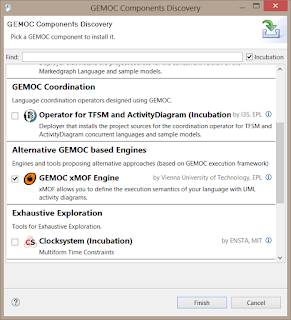 xMOF is provided as an additional component of GEMOC Studio. To install it, open the menu Help and select Install Additional GEMOC Components. Select from the category Alternative GEMOC based Engines the component GEMOC xMOF Engine. 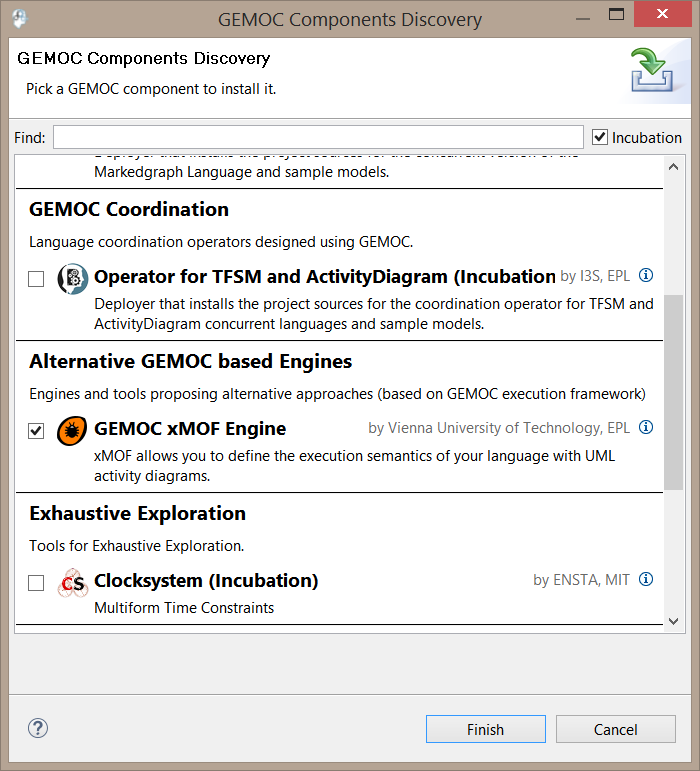 After selecting the component GEMOC xMOF Engine, hit the Finish button. Confirm the Install and Install Details dialogs by hitting Next, read and accept the license agreement and hit Finish. Confirm the warning about installing unsigned content and restart GEMOC Studio. The FSM language is a simple language for defining finite state machines. Its abstract syntax is defined by an Ecore model. For graphically visualizing FSM models, a Sirius-based editor is also provided for the language. We will see in this section how we can import the EMF projects implementing the FSM language and have a look inside these projects. The EMF projects implementing the FSM language can be downloaded as an archive file fsa-tutorial.zip from modelexecution.org. For importing the downloaded projects, open the menu File and select Import... In the opening Import wizard, select General / Existing Projects into Workspace. Chose the downloaded archive file fsa-tutorial.zip under the option Select archive file and select all projects located in the directory language_workbench. FSM models are simple I/O state machines. The abstract syntax of the FSM language is defined by the Ecore model fsm.ecore located in the imported project org.modelexecution.xmof.examples.fsm. As you can see from the Ecore model, a finite state machine (FSM) is a set as of states and transitions. One state serves as initial state. Each transition has exactly one source state and exactly one target state. In addition, each transition defines an input String and an output String. For each state, the inputs of outgoing transitions must be distinct to avoid non-deterministic state machines. The graphical concrete syntax for visualizing FSM models is defined by the Sirius viewpoint specification model fsm.odesign contained by the imported project org.modelexecution.xmof.examples.fsm.design. It depicts states as circles and transitions as edges with their input / output Strings as label. The example shows a simple finite state machine that accepts the input String “HELLO!” and produces the output String “WORLD!”. To make the FSM language executable, we have to first create a new xMOF project for the FSM language. To create a new xMOF project, open the menu File and select New &gt Other.... Select in the category xMOF the entry xMOF Project. In the appearing dialog New xMOF Project, you have to provide the name of the xMOF project and the name of the executable language that is going to be developed. Confirm the input by hitting the Next button. On the next page Ecore Metamodel File, you have to select the Ecore model defining the abstract syntax of your language. For this, click on Browse Workspace, unfold the project org.modelexecution.xmof.examples.fsm, select the file fsm.ecore and hit OK. The content of the Ecore model will then be displayed in the wizard page. As last step you have to select the main class of your Ecore model. This class will serve as entry point for the execution of FSM models. Select the class FSM as main class and hit Finish. The wizard created for you the new xMOF project org.modelexecution.xmof.examples.fsm.xmof.dynamic containing a new xMOF model fsm.xmof. This xMOF model provides configuration classes for all classes of the FSM Ecore model and will be used in the next step for defining the execution semantics of our FSM language. Before we go into the details on how to define these elements for FSM, we will first have a look at the desired execution behavior of FSM models. When executing an FSM model we want to process a sequence of input Strings and determine the output String produced by the finite state machine. For doing that, it is checked for each String in the input sequence whether one of the outgoing transitions of the currently active state can process it. A transition can process a String when it is equal to the input String defined by the transition. A finite state machine starts with the initial state as first active state. If a transition can process the current input String, the transition is fired. When a transition is fired, the transition output String is added to the output String starting with an empty String, and the target state of the transition is set as the new active state. To achieve the desired execution behavior we need a way to define the currently active state of a finite state machine as well as the output String of a state machine. In addition, we also need to store information about the accepted input sequence of Strings. This is referred to as the runtime state of a finite state machine. 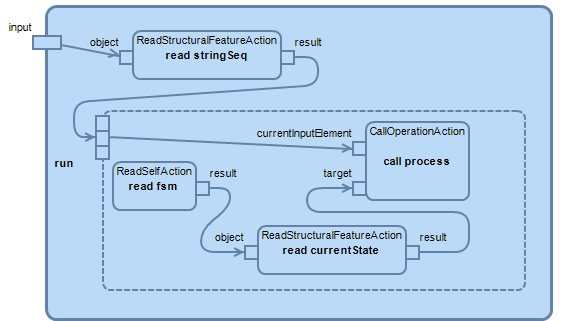 To define the runtime state of an FSM model, we therefore extend the configuration class FSMLConfiguration with a reference currentState to the State class, and the multi-valued String attributes producedSeq and acceptedSeq. The input processed by a finite state machine is an arbitrary sequence of input Strings. To enable the user of the FSM language to define such an input String sequence, we introduce the class Input into the xMOF model owning the multi-valued String attribute inputSeq. Note that the property unique of this attribute has to be set to false to allow duplicate elements in the sequence. Finally, we have to define that an input String sequence, i.e., an instance of the newly defined class Input, has to be provided for executing an FSML model. To do that, we have to add an input parameter to the main operation that was automatically added to the main class of our FSM language FSMConfiguration. To add this input parameter right-click on the operation main and select New Child > DirectedParameter. Change the name of the input parameter to input and set its type to Input. The main operation of the configuration class FSMConfiguration serving as entry point of the execution. The run operation of the configuration class FSMConfiguration defining the behavior of finite state machines. The process operation of the configuration class StateConfiguration defining the behavior of a state when processing an input String. The fire operation of the configuration class TransitionConfiguration defining the behavior of a transition when firing. To add a new operation, right-click on the respective configuration class and select New Child > BehavioredEOperation. Set the name accordingly and add appropriate parameters. With xMOF, the behavior of operations is defined with UML activities. To create the activity defining the behavior of an operation, simply double-click on the operation. The activity will be created and initialized with parameters corresponding to the parameters defined for the respective operation. For instance, by double-clicking on the main operation, an activity named main_FSMConfiguration is created. Now we can define the behavior of the created activities. Double-clicking on an activity or operation will initialize and open the corresponding activity diagram. We will start with the main operation. The palette on the right provides tools for the creation of activity nodes and activity edges. xMOF is based on the UML action language. Detailed descriptions of action types and other UML node types can be found in the UML specification. The modeling of the main activity is covered in detail in this tutorial. For the other activities only the final activity diagrams are shown. Information on how to install the complete example are given in the end of the tutorial. The main activity has to first set the initial state of the finite state machine as currently active state and then to process the provided input by calling the operation run. Finally, it has to provide the output sequence produced by the run operation as output of the finite state machine. For doing this, we first need to add a Read Self Action named read fsm to the activity. This action will retrieve the executing FSM element. Select the Read Self Action element in the tool palette and click on the diagram. In the appearing dialog, enter the name read fsm and click OK. In the same fashion, we create the remaining needed actions. 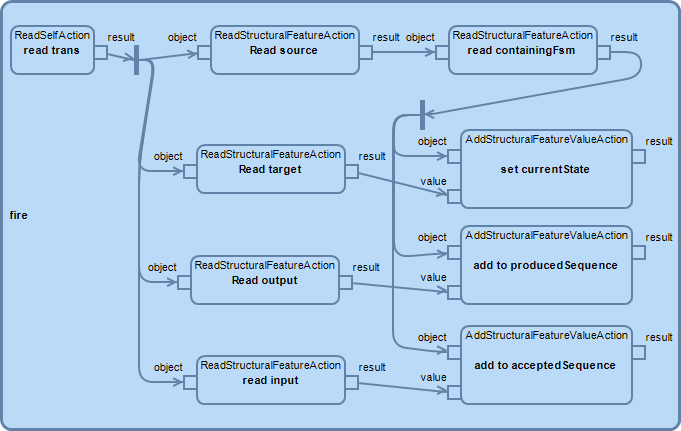 To access the initial state of an FSM, we define a Read Structural Feature Action called read initialState and set its property Structural feature to initialState. To set the retrieved state as currently active state, we furthermore create an Add Structural Feature Value Action named set currentState and set its property Structural feature to currentState. To call the operation run, we define a Call Operation Action named call run and set its property Operation to run. Furthermore, to pass the executing FSM element on to these actions, we create a Fork Node. Use the properties view to set the properties Structural feature and Operation. Now we can connect the created activity nodes with object flows and control flows. To add a new flow, select the required flow type in the tool palette and then click on the nodes you want to connect. 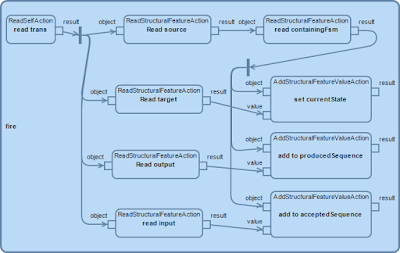 To pass along the executing FSM element, we need to connect the output of the read fsm action with the created fork node and the fork node with the target and object inputs of the actions call run, read initialState, and set currentState. Furthermore, the initial state retrieved by the read initialState action has to be provided to the value input of the set currentState action. Finally, the provided input parameter value has to be passed on to the run operation. All of these flows are object flows. However, these object flows cannot ensure that the run operation is invoked only after the currently active state has been set to the initial state of the finite state machine. Thus, we also need to define an additional control flow from the set currentState action to the call run action. The run activity reads the input String sequence provided by the input parameter value and then processes each element in the input String sequence by calling the process operation of the current state. The iteration over the input String sequence can be defined with an Expansion Region. The activity nodes contained by the expansion region are executed for each element of the provided input String sequence. The process activity determines for the current state whether one of its outgoing transitions can process the currently processed input String, i.e., whether one of its outgoing transitions defined the String as processable input. If such a transition is found, this transition is fired by calling its fire operation. Note that for the outgoing control flow of the decision node, a guard has to be defined. This has to be done in the tree editor. Switch to the tree editor by clicking on the Selection tab shown in the bottom left corner of the editor. Right-click on the object flow and select New Child > Guard Literal Boolean. Then set its Value property to true using the properties view. The fire activity of a transition has to perform the following tasks: It has to set the target state of the transition as the new current state of the FSM, add the output of the transition to the produced String sequence, and add the processed input String to the accepted String sequence. After the xMOF model has been completely defined, we have to generate Java code for it. To do this, right-click in the project explorer on the xMOF project org.modelexecution.xmof.examples.fsm.xmof.dynamic and select xMOF > Generate Code. The Java code is generated in the src foder of the xMOF project. Please note that the Java code has to be re-generated whenever the xMOF model is updated. As a next step, we have to create a GEMOC xDSML project for the FSM language that identifies the FSM language as executable language. The GEMOC xDSML project can be automatically generated for an xMOF project. For this, right-click in the project explorer on the xMOF project org.modelexecution.xmof.examples.fsm.xmof.dynamic and select xMOF > Generate xDSML Project. 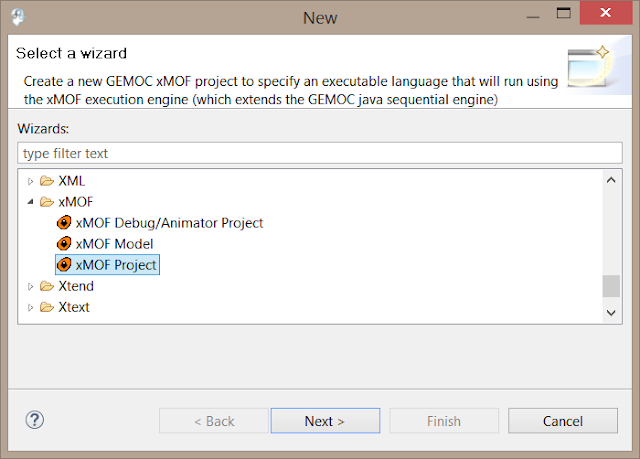 The generation of the Java code an the xDSML project can be also achieved in one step by right-clicking in the project explorer on the xMOF project org.modelexecution.xmof.examples.fsm.xmof.dynamic and selecting xMOF > Generate All. After completing the previous steps, you can already execute FSM models. If you are not interested in animating executing FSM models, you can skip this step and proceed with Step 9. To implement the desired animation, we first need to add an animation layer and corresponding animation service classes to the Sirius viewpoint specification model. For this, open the Sirius viewpoint specification model of the FSM language fsm.odesign located in the project org.modelexecution.xmof.examples.fsm.design. Right-click on the FSMDiagram element and select xMOF > Add Animation Layer. This adds a dedicated layer called Animation to the diagram and initializes the FsmdiagramAnimationServices class. To display the produced and accepted String sequences we need simple methods that concatenate all elements of the sequence to one single String. In addition, the order needs to be reversed as the elements are added in last-in/first-out order during execution. Note that after adding the methods you may get some import errors which can be easily resolved with the Eclipse Quickfix feature. To display the accepted and produced Strings, we create a container mapping called ExecutionInfo in the Animation layer and contained node mappings called AcceptedString and ProducedString as shown below. For these mappings set the property Domain Class to fsm.Fsm and the Semantic Candidate Expression to [self/]. In addition, change the property Child Representation of ExecutionInfo to list. Double-click on Eclipse Application, change the name to FSM Modeling Workbench, and click on Run to start the FSM modeling workbench. Import the project org.modelexecution.xmof.examples.fsm.samplemodels from the folder modeling_workbench of the downloaded archive file fsm-tutorial.zip into the modeling workbench. For this, open the menu File, select Import... > General / Existing Projects into Workspace, browse to the archive file, select the sample model project, and hit Finish. The imported project contains the introduced Hello World example and another example defining a finite state machine for traffic lights. To open an example model make sure that you are in the Modeling perspective. The perspective can be changed with the menu Window > Open Perspective > Others. Open the Hello World example by double-clicking on the HelloWorld.aird file. Then, expand the aird file until the FSMDiagram appears. Open it by double-clicking. Double-click on xMOF Executable Model. Change the name of the new configuration to HelloWorld. Select HelloWorld.fsm as the model to execute and HelloWorld.parameters1.xmi as the initialization model. Select the melange language org.modelexecution.xmof.examples.fsm.Fsm and the animator HelloWorld.aird. Finally, click on Debug. The Hello World FSM model now starts executing. After the execution engine has been started, a dialog Confirm Perspective Switch will appear. Click on Yes and the debugging perspective will be opened. Interact with the debugging model using the usual Eclipse debug commands. Use the control Step Into from the menu bar to execute the Hello World model step-by-step. The model will be animated showing the currently active state, the processed input Strings and the produced output Strings. 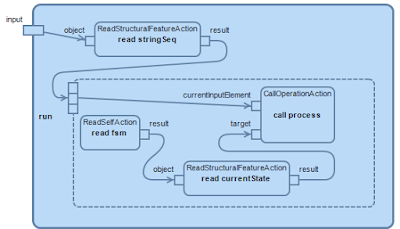 The stack trace view shows the next execution step to be performed and the variables view shows the current values of the different model elements. Below you can see the animation of the model after stepping three times. Congratulations! You have defined your first xDSML with xMOF. The complete FSM example is delivered with the xMOF component of GEMOC Studio. To install it open the File menu, select New > Other... > Examples / xMOF Language Examples / xMOF FSM Language, and hit Finish. All projects implementing the FSM language will be imported in your language workbench. In the same way you can also import the sample model project. Open the File menu, select New > Other... > Examples / xMOF Modeling Examples / Model Example for xMOF FSM Language, and hit Finish. For step 5, can this generated code be customized? Sure. What would you want to do? (c) Business Informatics Group. Simple theme. Powered by Blogger.